The 2012 Porsche 911 has a lightweight body made from aluminum and steel. Porsche plans a major expansion of its product range by the middle of the decade. CEO Matthias Mueller has promised at least one new model a year, starting with the redesigned 911 that arrives in the United States in February. An SUV that is smaller than the Cayenne will be added, along with an entry-level roadster. They could be joined by a sedan smaller than the Panamera and a plug-in hybrid supercar priced lower than the $845,000 limited-edition 918 Spyder. Entry-level roadster: A mid-engine car, developed with Volkswagen and meant to attract younger buyers, is expected in 2015. It will be based on the VW BlueSport concept shown at the 2009 Detroit auto show. VW will have a version, and Audi might, too. The car has been dubbed the 550 Spyder, but the name could change. There are reports that it will get a new 210-hp, 1.9-liter boxer engine. Boxster: The roadster will be redesigned in 2012, when it could get a four-cylinder as a base engine or as an option. An S Black Edition -- it's black inside and out -- went on sale in the spring. Worldwide production will be limited to 1,000 cars. The 3.2-liter six-cylinder engine got a 10-hp boost, to 320 hp, for the special edition. Cayman: The coupe derivative of the Boxster will be redesigned in 2013 or 2014 and could get a four-cylinder engine option. The S Black Edition, limited to 500 units worldwide, went on sale in the spring. The 3.4-liter six-cylinder engine got a 10-hp boost, to 330. 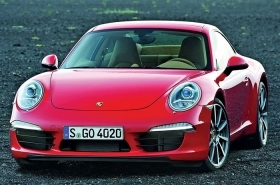 911: A redesigned seventh generation of the Porsche model goes on sale in the United States in February. It's 2 inches longer, and the wheelbase has been extended 3.9 inches; that means it's roomier, especially for rear-seat occupants. A new lightweight body is made from aluminum and steel instead of the all-steel structure of the current car and weighs 198 pounds less. The redesigned 911 is available with a 3.4-liter six-cylinder boxer engine that makes 350 hp and a 3.8-liter boxer engine that pumps out 400 hp. This autum, Porsche began selling the GT3 RS 4.0, which is based on the platform of the current 911. Only 600 will be sold worldwide at a price of more than $185,000. Porsche said the 500-hp 4.0-liter engine is the largest it has ever put in a production car. 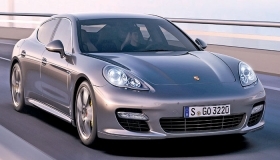 Panamera: The four-door sedan will be freshened in 2012. A redesigned model expected in 2015 or 2016 will share a platform with Bentley and Lamborghini. A coupe and convertible version are possible. A hybrid version of the four-door Porsche went on sale this autumn. According to published reports, Porsche also plans a station wagon version. Small sedan: Porsche is said to be considering a small sedan, possibly a compact, that is code-named Pajun, for Panamera Jr. It is unclear whether that car would use a shortened Panamera platform or one from the VW Group. It could go on sale as early as 2016. Coupe, convertible and station wagon variants are possible. Cayenne: A freshening is expected in 2013. Cajun: An SUV smaller than the Cayenne is scheduled late in 2013, using a platform shared with the Audi Q5. 918 Spyder: Porsche plans to produce 918 units of the range-topping plug-in hybrid convertible, which will be available in 2013 at a price of $845,000. The 918 Spyder is powered by a 500-plus-hp V-8. Porsche hasn't provided specifics on the displacement. Electric motors will be mounted in the front and rear. The car will have a seven-speed double-clutch gearbox. 960: Porsche is considering a plug-in hybrid supercar positioned between the 911 and the 918 that would debut in 2015 or 2016 and would compete with the Ferrari 458 Italia. The 960 name is not confirmed.